We believe that no one can be too prepared. 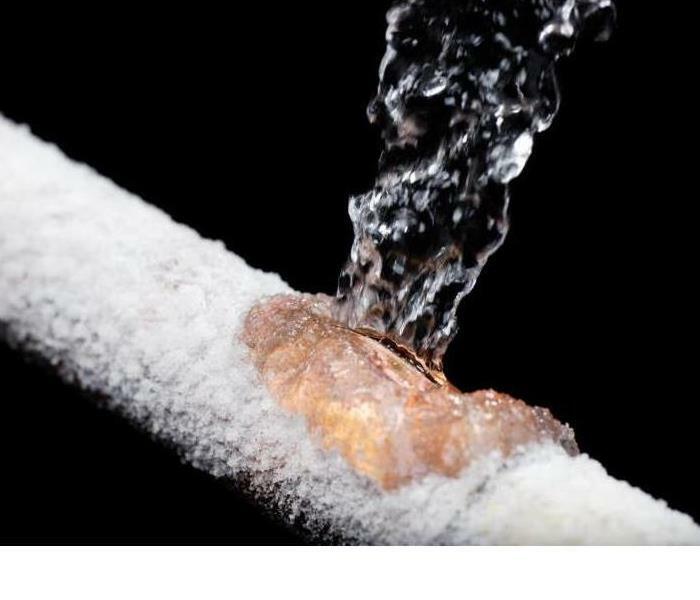 Being prepared can help you avoid expensive issues of frozen pipes. Drain water from swimming pool and sprinkler supply lines following manufacturer's or installer's directions. Remove, drain, and store hoses. Close inside valves supplying outdoor hose bibs. Open the outside hose bibs to allow water to drain. Keep the outside valve open so that any water remaining in the pipe can expand without causing the pipe to break. Check around the home for other areas where water supply lines are located in unheated areas. Insulation being taken out of the home. What’s worse than a water main break in your basement? A water main break in your attic! This home was left in ruin after a frozen pipe in the attic burst, causing thousands of gallons of water to flood the entire home. 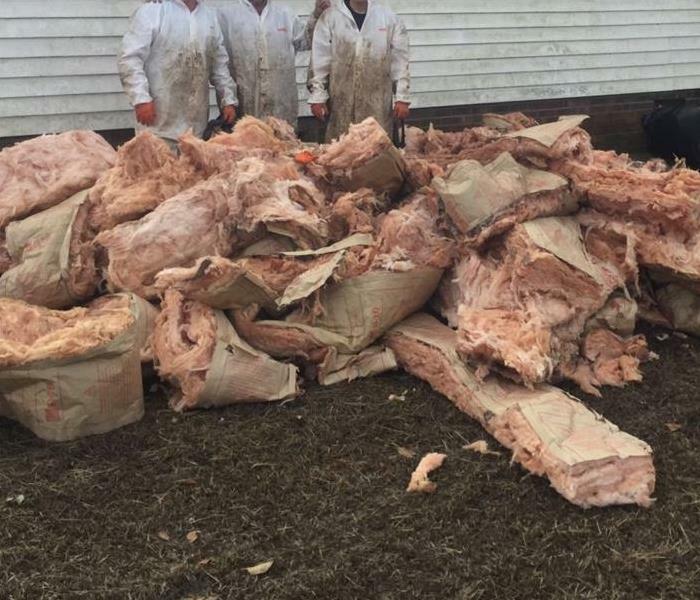 SERVPRO of Blackfoot/Pocatello was called to clean up the aftermath! Your nose can detect MOLD! 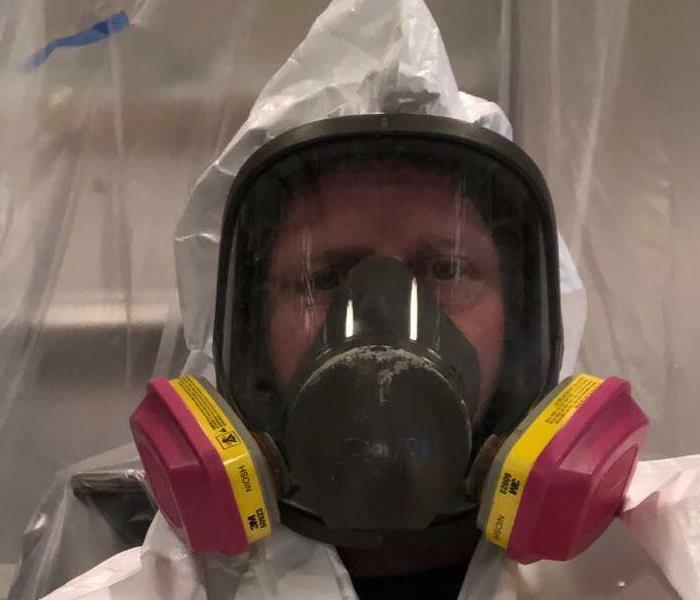 Here is one of our team members in full gear while removing and cleaning mold. SERVPRO of Blackfoot/Pocatello has held a Continuing Education Class for Realtors on Mold. SERVPRO offers these Continuing Ed classes to both Insurance and Realtor Professionals Free of Charge. Realtors from Shelley, Blackfoot, Pocatello and surrounding areas gain valuable knowledge on the factors, dangers and remedies for mold. SERVPRO stresses that first it is important to remove the moisture source, make sure the area is entirely dry and afterwards a in-depth cleaning is in order. SERVPRO also warns of the importance of wearing a mask that can filter the fine particles and gas as well as other proper protective equipment. We here at SERVPRO explain the biggest indicator of mold is your nose since mold can grow anywhere there is moisture and leaves a bad smell. Here are some suggestions homeowners can do to prevent mold from getting out of hand included keeping crawlspace/attics, and storage areas vents open year-round and making sure attics have proper ventilation. Since airflow is extremely important, we also suggest making sure dryer vents are properly attached and that the air flows to the outside of the house, not under it. What you need to know about Storm Damage? No matter where you leave you might experience smaller storms with minimal damage to your building. Whenever there is a storm it’s always good to have a professional on your side to asses and rebuild what was damaged. Wind Damage- When a storm hits your home and/or commercial building most likely wind will be involved. Winds can cause roof damages, fallen trees, and broken windows. A professional should be in a place to offer solutions to any wind damages sustained to your home. Ground Water- During a storm the ground loose, its ability to drain all the water. When this happens dirt and soil become soft and start to float along with the water. When storm water sits, it starts carry debris and become a health concern due to the diseases it can carry. For faster drainage, call a professional. Professionals can use a pump to remove flood water from your house and/or commercial building. Also, it is important to consider a company that specializes in clean water restoration. Hail Damage- Whenever there is a rainy disaster it can also be in the back our minds that hail will be present. Hail can cause serve damage to roofs, siding, stucco, windows, and screens for windows and sliding doors. With these types of damages, you will need to go through your insurance company to see what will be covered. Does your Blackfoot/Pocatello home have a Mold Problem? Example of mold found in a personal home. If your home or business has a mold problem, we can inspect and assess your property and use our training, equipment, and knowledge to remediate your mold issue. Just like in a residence, if the plumbing system in your workplace fails water damage could be the result. This is another cause of commercial water damage that often catches business owners by surprise. Should the sewer line to your building back up or become damaged, realize the potential dangers of contaminated Black Water which can cause health effects and ruin products and office furnishings. If your business has suffered commercial water damage, SERVPRO of Blackfoot/Pocatello will help your business back up on its feet... Call us 24/7 at (208)-242-3819. Flooding and water damage events at can lead to commercial properties numerous issues that require a knowledgeable and flexible response. Whether we’re dealing with a relatively small water cleanup scenario or a large scale event, we work quickly to assess each unique situation and isolate the damaged area. In many instances, normal operations can continue in a temporary space while we restore your facility. SERVPRO of Blackfoot/Pocatello specializes in the cleanup and restoration of commercial and residential property after a water damage event. Our staff is highly trained in property damage restoration. From initial and ongoing training at SERVPRO’s corporate training facility to regular IICRC-industry certification, rest assured our staff is equipped with the knowledge to restore your property. When a Storm or Flood hits, SERVPRO is ready! SERVPRO of Blackfoot/Pocatello specializes in storm and flood damage restoration. Our crews are highly trained and we use specialized equipment to restore your property to its pre-storm condition. When storms hit Eastern North Carolina, we can scale our resources to handle a large storm or flooding disaster. We can access equipment and personnel from a network of 1,650 Franchises across the country and elite Disaster Recovery Teams that are strategically located throughout the United States. Call SERVPRO of Blackfoot/Pocatello if you suspect mold in your home or business. Contact SERVPRO of Blackfoot/Pocatello for mold remediation services. SERVPRO of Blackfoot/Pocatello specializes in mold cleanup and restoration, in fact, it’s a cornerstone of our business. Our crews are highly trained restoration professionals that use specialized equipment and techniques to properly remediate your mold problem quickly and safely. 2/23/2019 - Your nose can detect MOLD! 7/25/2018 - What you need to know about Storm Damage? 7/25/2018 - Does your Blackfoot/Pocatello home have a Mold Problem? 7/21/2018 - When a Storm or Flood hits, SERVPRO is ready!